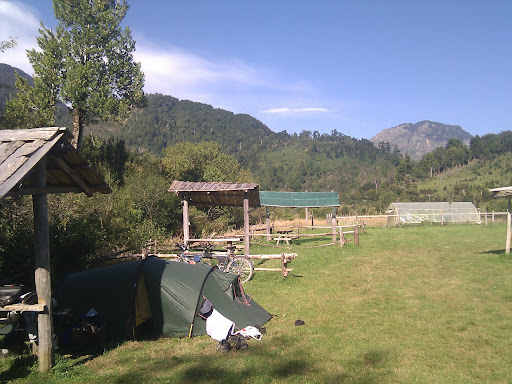 Another blindingly hot day, we took it steady for the 45 km to La Junta and found a delightful private campsite (photo) just out the other side. We have yet to find the owners though! We ate out last night (in a cafe thing mostly occupied by a motorcycling group. From the sounds of it, motorbiking on ripio isn't that easy either) but failed to find anywhere doing pudding so bought a cake to eat back at the campsite. Along the way we failed to get any bread, so picked some up this morning for a breakfast a mile down the road, and stopped again for more snacks a few times including at a national park picnic area by the lake. Bought more supplies in town this evening as tomorrow we might well be wild camping again for first time in what seems ages. Although, I did note today that 4 of the last 5 organized campsites failed to live up to their hot showers claim, at least on the first attempt of using! (Wood-burning boilers are not exactly on-demand appliances, and cyclists tend to want showers at odd times in the afternoon/evening). Tomorrow may also be notable for being our final day on the carretera Austral. At Villa Santa Lucía we will take the fork towards Futaleufú. Odd to think this first major part of our tour will be coming to a close, even though we're some 10 days behind our optimistic estimate for being here. Oh, and the answer to yesterday's conundrum is Puyuhuapi is pronounced pooh-you-wapi. So now you know.